(Dallas, TX – June 4, 2015) – The biggest Gospel tour of the year is coming to a city near you. 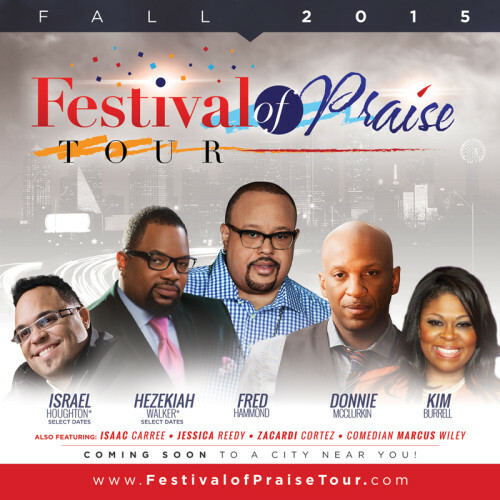 Festival of Praise, a 50-city concert tour features some of the best names in Gospel music including multiple GRAMMY®, Dove and Stellar Award-winning recording artists Fred Hammond, Donnie McClurkin, Kim Burrell, with Hezekiah Walker (in concert 9/30-10/31) and Israel Houghton (in concert 11/1-11/29). The tour also features Isaac Carree, Jessica Reedy and Zacardi Cortez. Marcus Wiley of the “Yolanda Adams Morning Show” will be this year’s festival host. The national tour kicks-off at Fallbrook Church in Houston, TX on September 30, and runs through November 29. Pre-sale tickets for the tour begin on Monday, June 8. For a listing of tour dates and to purchase tickets, please visit www.festivalofpraisetour.com, additional shows will be announced in the coming weeks. Festival of Praise partnered with VIP Nation for premium concert ticket packages, which includes a VIP meet and greet in each market. VIP packages will be available by Monday, June 8, for more information, please visit www.vipnation.com. The Festival of Praise International Tour will kick off in the first quarter of 2016. The Festival of Praise Tour is created by Fred and Ray Hammond and produced by Face To Face, Inc. Adam Zagor of Universal Attractions Agency is the booking agent and Al Wash of ALW Entertainment is the entertainment consultant.